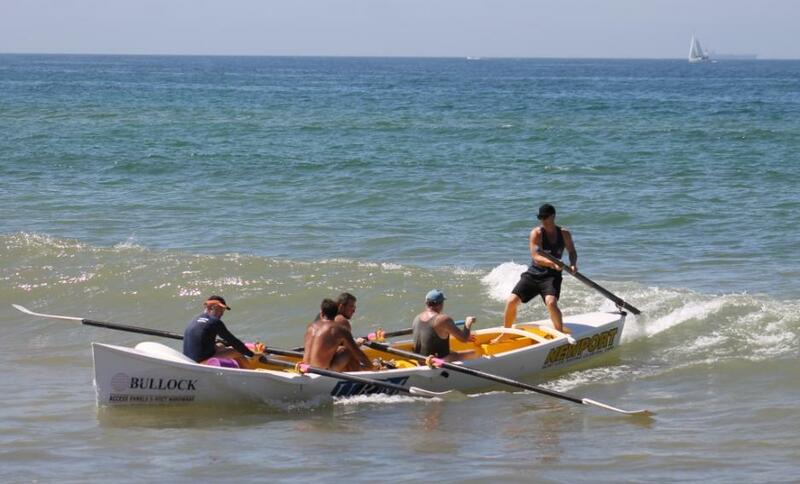 On Sunday, March 24th 2013 the club launched the Newport Surf Racing Academy, a bid to stop losing their talented water competitors to Queensland clubs. North of the border surf club facilities are similar to our RSL’s and as a result have a larger revenue to support athletes in this area of sport. The coaches, Nick Carroll and James brooks, parents and the young adults at Newport have a plan to nurture talent from an early age and develop a structure capable of retaining elite talent on the northern beaches. In the past Sydney Northern Beaches have lost top competitors like Jeremy Cotter, Matt Poole and Kendrick Louis and Newport SLSC want to see this trend reverse. It will take champions though, champions of surf life saving and of children who will come forward and support these champions. In 2012 this squad had great results at the Aussies (Australian Open Championships), winning Under 17 Men`s Surf Teams Race Championship - Newport A (Jonah Beard, Max Brooks, Cooper Halligan, Jayke Rees) , Under 17’s Surf Board Relay, Board Rescue and the under 17’s Iron Man with Max Brooks. At the 2012 Coolangatta Gold, one of the most gruelling events in Surf Life Saving, both the under 17’s and under 19’s performed well coming out of Winter with Max Brooks claiming victory in the U19 division with Cooper Halligan 4th, Lachlan Reid 5th, and Fletcher Davies 6th the team dominating this division. A few weeks ago, at the 2013 NSW Open Surf Life Saving Championships held at Ocean Beach-Umina, the team won the gold medal in the Open ski relay, (Tom Atkinson, Chad Alston and Luke Morrison), with Max Brooks taking out the gold in the taplin relay, board relay, surf team, double ski and single ski relay. Max was also strong in his individual events taking silver in the U19 single ski and board race and the bronze in the U19 ironman. His younger brother Charlie took the gold in the U15 board relay and silver in the U15 surf teams, ironman and board rescue. Jonah Beard, another Newport SLS won gold in the U19 male surf race and was awarded the Saxon Bird Memorial Trophy. “Today is not the start of the process as we’ve watched many in this room and many of the current squad for more then a decade as they commenced learning their life saving skills as five year olds with our Nippers program. We’re very proud of them and have had a long connection with many of them. As a club of 1400 volunteer members we’ve all marvelled at their tenacity to train unbelievably hard and enjoyed their journey and development into the wonderful young men and women that they currently are. This program, which has been running for a number of years and is being launched today is not only about making great competitors, it’s more about making wonderful community orientated people and there has certainly been a lot of success in that. Today is the launch of the Newport Surf Racing Academy which will be a vehicle for ensuring that our local young surf life savers have the same opportunity as their counterparts in other areas of Australia, for example, in Queensland, who have greater opportunity to make a much more significant revenue then we do. The Newport Surf Racing Academy’s only objective is to provide these young people and help them with ongoing assistance with their equipment and training. It will also provide an opportunity for training work for the army of young children who are following them in the future. As a club we’ve invested significantly in these young people and they’ve repaid us many times over not only in the value they provide in significantly improving our surf life saving patrols, and trust me; if you’re drowning at Newport you want to be drowning on the day that these people are on patrol, but also because they have provided fantastic competition results for our local community. 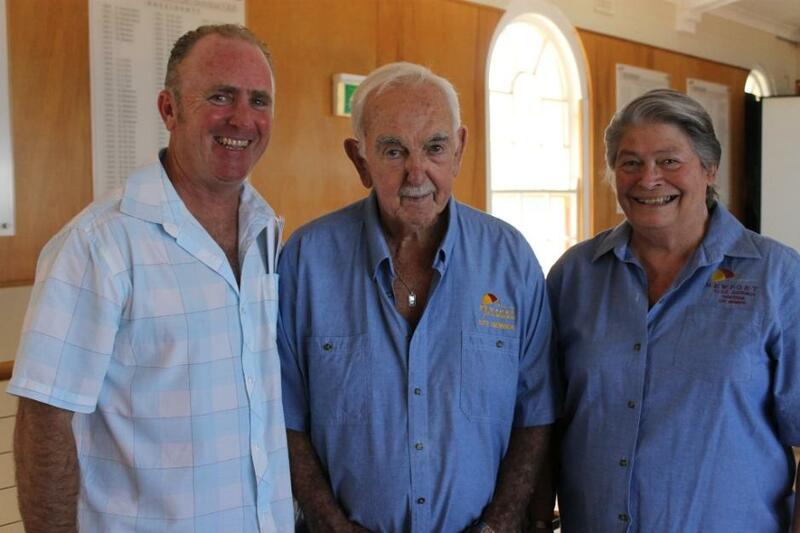 Newport SLSC President Rob Emerson with Bert and June King - Life Members and local surf life saving legends. Tom: In 2012-13 we’ve had a couple of young men who moved to the area and came to spend some time with us. We picked up Tom Atkinson who has come to Newport and is now competing for us. Tom is the only competitor in the current Nutri Grain Ironman series who doesn’t compete for a Queensland club. In the 24/25 guys that are currently competing in the Nutri Grain Ironman series this year Tom is it for NSW and basically carries the blue flag everytime he competes. If you follow this you’ll see he has been really highly ranked right the way through. We’ve also picked up Chad Olsen and Luke Morrison, both of whom were living in South Australia and moved up to Sydney and ended up moving just across the road. They decided they wanted to paddle skiers and compete through the club; it’s handy that Luke Morrison is an Australian Kayaker and a world champion, winning gold in the K2 1000 at World Cup 2 in 2009, while he was a member of the K4 1000m team that won silver at the 2010 Duisburg World Cup and Chad is not too far behind this pace either. You would have seen the pair of them won the State and Double Ski, they were also part of Newport’s first ever Open Taplin win at the Manly Open Carnival this year. So we have that kind of potential in the club; the current ‘crop’ that we’ve bred ourselves and the potential going forward and the boundaries that these guys have is basically limitless. Just when you think they can’t do anything better they go and blow you away completely. As you saw in the video presentation competing in the Worlds and winning medals there wasn’t enough; the team then went and won medals on the sprint track; just when you think there’s no more records for these guts to break they do and set ridiculously high levels for themselves. We’ve got a large number of guys in Year 12 this year. Tom, who I just mentioned, has just started his own business, so you can get an understanding of how this fits into their everyday lives, the level of commitment these guys show. I was struggling myself at times to fit in training with work but these guys blow my training/work balance well and truly out of the water. James Brooks: I don’t want to be bashful about our ambition here; we have a very very clear vision to build a centre of excellence for Surf Life Saving NSW. We are determined to find the right program and the right financial support to stop losing the best athletes in NSW to Queensland. Today isn’t the start of that program; we started about seven years ago. Today is another step in that program. I just wanted to give you some perspective on this year’s Nutri Grain series; it does give you perspective as to why I’m passionate and why so many other people are passionate about what we’re trying to achieve here. The final rankings in the Nutri Grain series (this year), seven of the top ten at the end of the series were ex-NSW athletes that went over to Queensland. In fact it was eight of the top eleven that came originally from NSW. Tom finished 11th in the series which was an unbelievable effort. I don’t know if this is better or worse, depends which perspective you put it in, but five of the top six placegetters in the series were from NSW. So these are guys who had done all their junior work down here and had to make a decision at 17, 18 or 19 in most cases to move north. Even better then that two of the first four placegetters in the series were Sydney’s Northern Beaches athletes that had relocated to Queensland. So Matt Poole, he was with Dee Why and a Queenscliff junior, he relocated, and Kendrick Louis, whose parents are here today and whose brother joined our club, and has been nominated as the next superstar in the sport, was actually a Nipper in this club. Everyday I wake up and when I’m tired or thinking ‘this is hard’ I remember if we had this right they’d still be here today. One of the things I truly believe and I have had the privilege of talking to a lot of people who were NSW athletes and moved north, is in most cases they don’t move because they want to move. They’re not like ‘hey, I’m 19, I’ll leave my whole family and my mates that I’ve been racing with for 8 years, and go to Queensland’. They don’t move for those reasons. They move because, as has been highlighted before, it is an extremely expensive sport financially, for the average guy here it is a seven to eight thousand dollars a year sport. A new ski is $3800.00. a new board $1800.00; you have to pay for the privilege of getting up at 4.30 in the morning to go and swim for two hours at a rate of about $2000.00 a year. It just seems so distorted, doesn’t it. You get up and get punished and you’ve got to pay for it. The sum of that is around $8000.00 a year. When you hit a certain level in this sport it’s not good enough to have one craft; you need two skis and two boards. So for a lot of these guys, and in some cases they’re adults and have got to fund this themselves, the easy option, quite frankly, is Queensland. So the sum of the financial support and the effective programs that they have up there has driven just about all of our really good athletes north. We just about have the program here right; I believe that. Nick and I are, if nothing else, perfectionists. We spend every week thinking how we can improve next week and every month thinking how we can improve next month. We will continue to do that. I think we can get the program piece right but we clearly need the financial support to make this viable. A bit of history; Nick and I got involved in this together about seven years ago. We come from totally different walks of life. I grew up doing a bit of swimming in the pool and was not extremely successful but was ok. Nick was one of the best surfers in the world for a period of time and we came together on the beach one day and thought we might be able to coach surf life saving, basically knowing nothing. Very early on we realised if we could build a good group, with the goal of being a team and placing the ethics and the emphasis on being a great team and supporting the team ahead of being an individual, we might just get this right. Along the way, with both of us having a thirst for knowledge and seeking ways to improve it, we’ve managed to lift the bar every year, and we truly believe that these guys and the fact that they all; I was so proud when I heard them talk here today talk about what it means to be a team member here and how exciting that is ahead of being an individual, I really feel that the deep culture of what we are doing here is right. To give you some perspective of what they do in training; most of these guys are doing a minimum of ten sessions a week is the bottom end of our program. The top end is probably 14 sessions a week if you want to work at the Iron Man level. 14 sessions constitutes around 24 hours every week of hard physical activity. And a further perspective for anyone that watched today; that was a recovery session for us. The guys raced yesterday so today we didn’t want to train them too hard so that was one of their easier ones. So we’re talking about 24 hours per week of commitment. To me, beyond everything else that they achieve, the fact that they’re young adults in some cases, older adults in other cases, in Tom and Chad’s cases, shows their own level of commitment and passion. In a lot of cases here when their friends and peers at this point in their life are spending their time watching television or on the computer or complaining to their parents about being tired, and trying to get into the pub, what these individuals are doing in the sacrifices that they make is just inspirational to Nick and I and the Newport Surf Club. We started the training last May, so I figure they’ve done about four thousand kilometres between May and where we are today. The thing I like about that is one of the things that Nick and I decided earlier on is it wasn’t that they became good athletes but that it’s far more important to us that they become good people and we set them up with the right ideals for life… And to try and understand the link between sustained effort and sustained commitment and sacrifice and reward. I can tell you that there are individuals here there two or three years ago were struggling to make our relay team. We’re going to the Australian Titles in two and a half weeks and some of those same individuals have a chance of winning individual gold medals. So, believe me, they understand now what happens with sustained commitment and the rewards that can come from that. Suffice to say that what they achieved in the last couple of years is way beyond our expectations. …we set ourselves goals, and these guys actually always try and extend goals, but we really understand when you’re in the ocean that there are a lot of things out of your control, we really focus on just being the best you can be. We came up with a motto last year for the crew which was “Be the best, enjoy it the most”; and we live by that motto. That is, really, who I think we are when we are on the beach and I sincerely believe that the admiration that we have now from other clubs is not so much about our results, it’s about how much we enjoy it. These guys are always having fun and enjoying themselves. The results so far this year, when I see them up on the board, it amazes me. The Open Taplin at the World’s was an unbelievable race and the Coolangatta Gold last year was great for them too. And I said ‘oh, is that right .’ so we said to the guys if you want to do well in the Gold here’s what we’ve got to do and it’s not going to be pretty. And they did it. It amazes me sometimes that they do all that they do; Nick and I say, middle of July, middle of winter, very cold, ‘swim out to the shark nets and back’ and they dive in and do it. It is just amazing; whatever we’ve asked them to do they’ve done. For the Coolangatta Gold, when everyone said you couldn’t prepare properly down here and in the under 19’s we got four of the six divisions including the winner. So that reminded me…the weather is nothing down here, the weather makes you tougher, that’s what it does. In the Iron Man sport or Surf Life Saving sports, these are gladiators sports, when you stand on the line of a Sunday at the State Titles or Australian Titles everybody is tried; everybody has done 30 or 40 races. And the harder your preparation has been, the more adversity you have faced, and you an draw back on all of that, the pain you’ve been through, what you’ve done with your team mates swimming in the cold, the easier it is. So I actually think in many ways that preparation and training really hard and well is a strength for us. To summarise; I don’t want to be bashful about what we need here; we need financial support. There’s a lot of people here, athletes, that are worthy of our support. Athletes that will do anybody who invests in this program proud and make them feel good about being associated with this. If we’re truly going to mix it with the clubs up there we need the people in the room here and people out there to find people that want to get involved in something that’s pure, involved in something that’s really meaningful, and involved in something that effectively is going to reverse history. We can end up with people in this club who are competing and being successful in both the Open and Australian Surf Life Saving championships AND the Nutri Grain series. I make no empty statement here; we are going to do that do that and tonight is another step in that process. I want to end by acknowledging the guys here (kids); I’m pretty hard on them sometimes and Nick’s pretty hard on them too; but I just get overwhelmed sometimes with level of quality of you guys, both as athletes and as individuals. I’ve seen a lot of you grow from 11 year olds and you’re now turning into adults and it is so rewarding to myself and Nick to watch you guys grow into wonderful adults. It just happens to be a bonus that at the same time that while you’re growing into phenomenal athletes and in some, in many cases, what we’re attempting to do is rewriting history. Some of our results over the last few years I’m sure are better then you’ve achieved before and I’m sure we have bigger things ahead of us. Your commitment to both the program and your commitment and support for each other is inspirational to me and to Nick and I know to everyone in this room, so I thank you guys from the bottom of my heart. It is now 24 sleeps to the Aussies; and I guarantee you Nick and I have every single minute planned between now and the Aussies so I tell you when we’re there we’ll be ready, ready to do well and to have a whole lot of fun. So thank you guys, thank you to everyone else for being here, we appreciate it and we’d love you to support our group. Our Pictorial this week is some of last Sunday's Recovery Session at Newport so you can see how hard this squad trains, even on a Sunday. We witnessed rounds of board, swim, ski and sprints for almost two solid hours. If you want to get in contact with the team at Newport SLSC their website is HERE. Information Booklet on the Newport Surf Racing Academy HERE or for Mobile devices. Rob Emerson, President, can be contact on 0417 413 912 if you want to get in the ground floor of what is sure to be one of the best things happening this year for N.S.W and Pittwater. 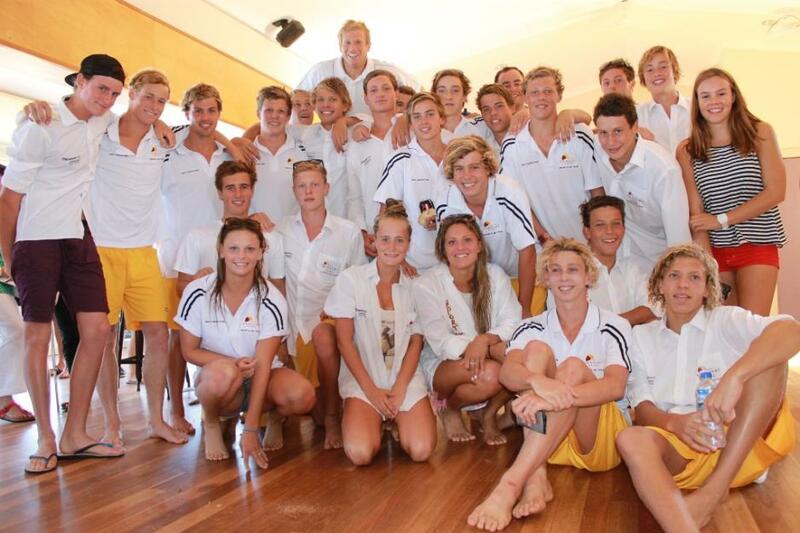 Nick Carroll, James Brooks and the Newport SLSC squad. 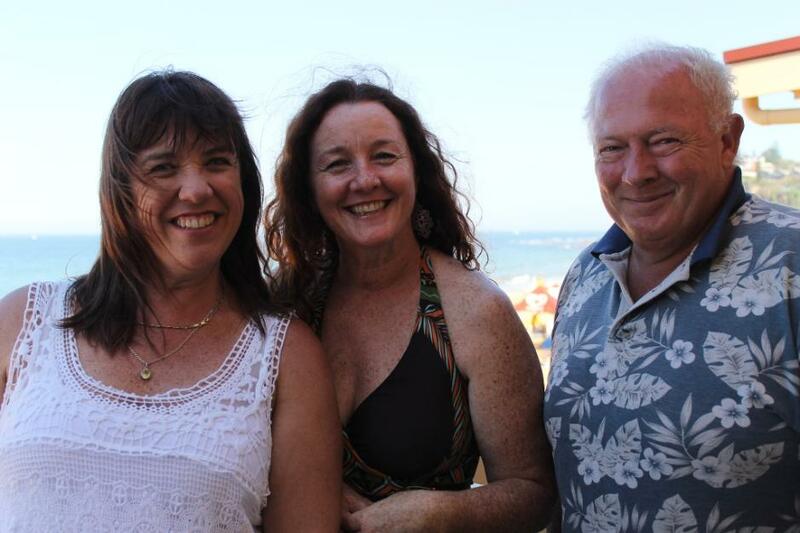 Pittwater Councillors Julie Hegarty, Kylie Ferguson and Ian White at the launch last Sunday. 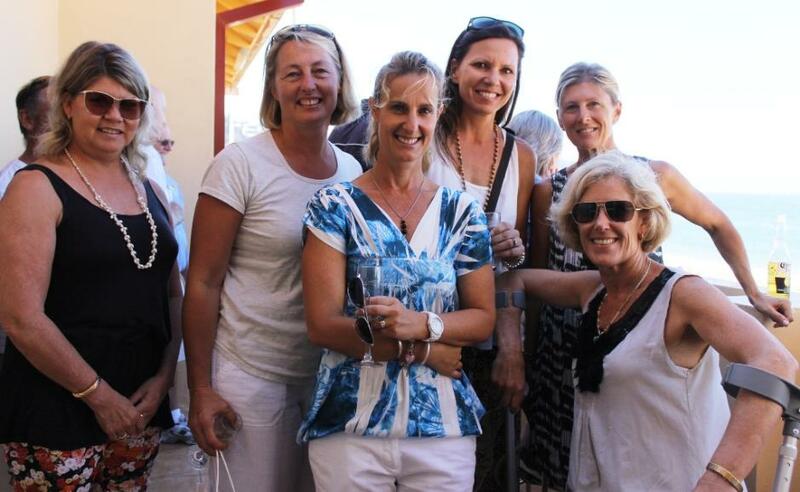 Newport SLSC ladies at Sunday's launch. 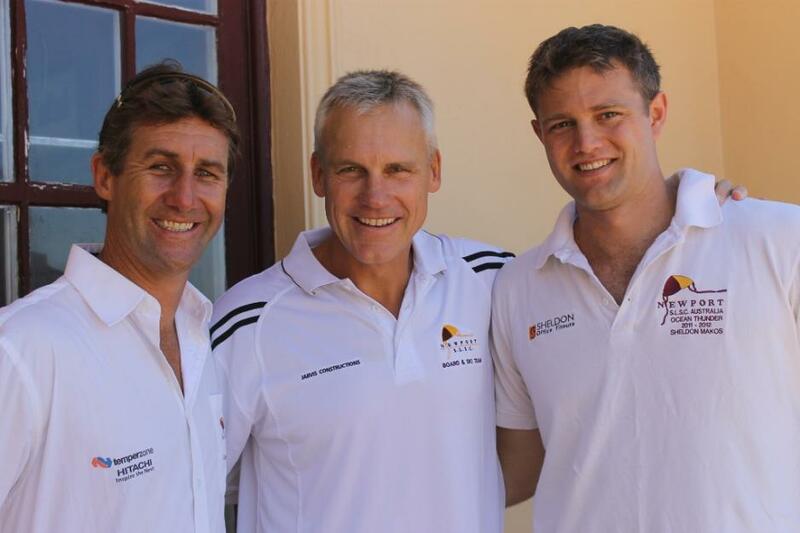 Simon Euers, James Brooks and Tom Kellaway of Newport SLSC.